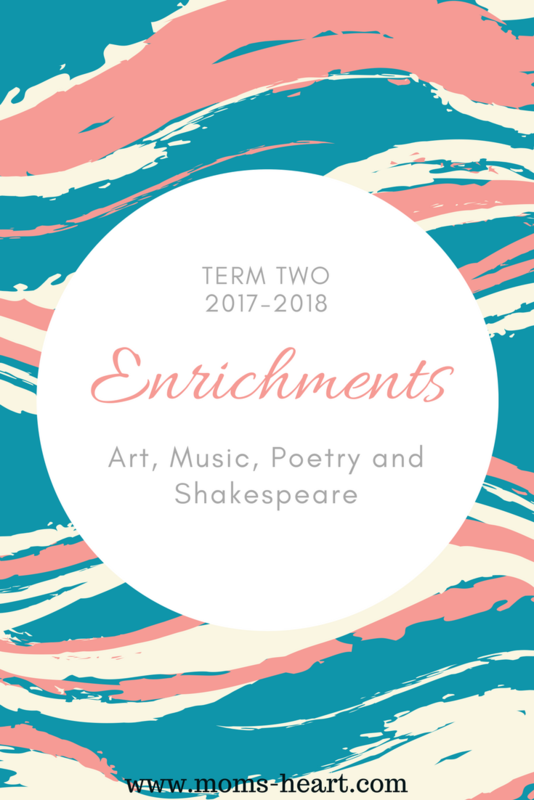 We're just finishing up our second term of enrichments! I was a little nervous about adding all this stuff in at the beginning of the year, but the kids really enjoy most of it! I didn't use any extra books or try to turn it into a full study. Right now, I just want it to be about appreciation, and maybe occasional recognition of a piece. I typically stream through Alexa while we're cleaning, or sometimes over lunch if I'm not up to reading that day. We did listen to a few Classics for Kids episodes, because I like that it gives a solid mix of biographical information and music appreciation, and we used a quote attributed to him for copywork occasionally. For fun, we listened to Roll Over Beethoven! As soon as we did our first picture study this year the boys begged to study da Vinci so we could study the Mona Lisa! I had him on the list anyway, because we were going to study him as a scientist (though that changed when we switched to AO), so I tried to read that book, but we didn't find it overly engaging, or necessary for the process. Maybe in high school for an art history credit, but for now, it's like composers. I'm going for appreciation and recognition. We did occasionally look up an accompanying video on YouTube about a piece of art, since I just bought the extra art prints and not the full picture study portfolio. We studied the most popular ones for one week, and then left some of the lesser-known-to-us prints up for two weeks. We didn't necessarily study the second week (especially holiday weeks) but just reviewing the title and leaving it out for exposure. We covered all eight prints again, and on the last week I spread the prints out and called a title, and they chose to the correct one. Quick and easy review! I had been following AO's recommendation of one hymn per month, but this was about the time I started choosing our own hymns. During hymn time, I only play our monthly hymn and we look at the lyrics, but then I play various music in the background when I'm working in the kitchen or something, so they hear them all again anyway. I did decide to continue following AO'S Folk Song rotation for the most part. I have no better method of choosing, and they offer a lot of variety! Most of the kids usually enjoy the choices. I have two of his books I picked up at a book sale, and just chose one for poet study. The kids all enjoyed these. It seems twaddly on the surface--they are wacky and ridiculous and impossible--which is what appeals to the kids! At the same time, there were some nuances in there, some poems that really drove home some valid points about society, and I noticed the 11 year old commenting on some of them. I might recommend him for kids who are against poetry for some reason, primarily because the humorous approach will appeal to the witty and sarcastic child, but I won't likely ever use him for a poet study again. We didn't pick up where we left off with A Midsummer Night's Dream. In fact, we took some time off, and it was near the end of Term 2 when we started fresh with The Tempest. Right now, I'm doing a retelling by Bruce Coville, and Emory LOVES it! I want to try the full script next, maybe listening along on audio. We'll see.